In the past, Surface Acoustic Wave (SAW) technology has not been used for inline measurement of the flow rate in pipes. Now Bürkert presents FLOWave – a completely new SAW-based device that allows a flow measurement of liquids without any parts within the tube and eliminates many weaknesses of established flowmeter principles in the market. Further special advantages result from using FLOWave as a multi-parameter measurement device, the independency of the fluid’s conductivity as well as the low weight and small outer dimensions. FLOWave is a compact flowmeter for use in liquid media, consisting in an initial version of a transmitter with or without a display and a sensor with clamp process connections. The underlying Surface Acoustic Wave technology uses wave propagation for the measurement, similar to that in seismic activities. A major advantage of the patented technology is that there are absolutely no components inside the measurement tube, so the liquid is only in contact with the stainless steel tube. As well there are no constrictions and dead flow zones in the measuring tube. The inside of the tube can be manufactured with the same surface quality as the rest of the piping and is identical to any other straight pipe section with respect to hygiene, cleaning and flow conditions. There is no pressure drop and no effects of fluids on sensor elements, nor can the medium be impaired by the latter. Standards for tube and process connections in material and size are observed. The sensor selection is easy as this is mainly limited to the size of the tube and the required type of process connection. The device requires no maintenance. 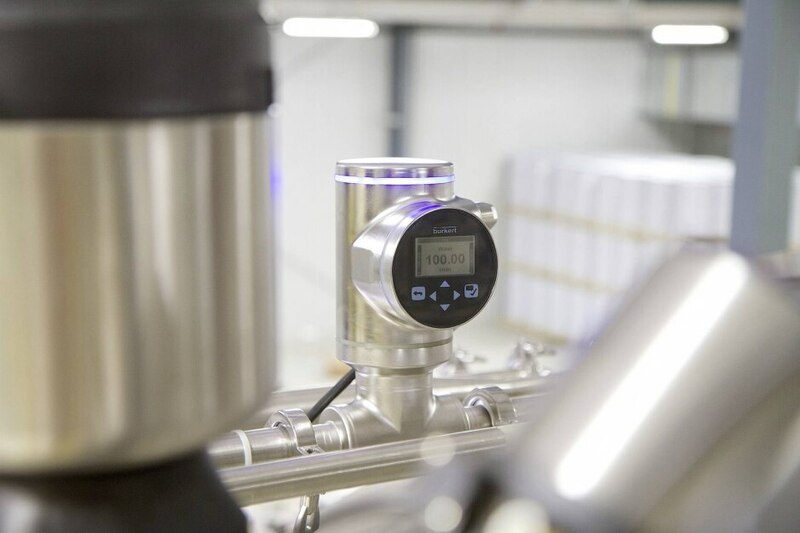 Both the transmitter and the entire sensor, including the measuring tube, fulfil the highest standards of hygiene, which makes FLOWave ideal for the pharmaceutical, food, beverage and cosmetic sectors. The compact design and low weight of the FLOWave allow an altogether lean system design as well as easy installation and transport. FLOWave also meets the growing demand for low power consumption. In addition to the measurement of flow rate and temperature the next step will be to expand FLOWave to measure additional parameter such as density and mass flow rate, which will then make it one of the few devices in the world that are even capable of such a broad spectrum of functions. The measuring device can be operated without restrictions when installed in horizontal and vertical position and also works with non-flowing liquids, so that measurements are available even in the case of minimal flow rates. Disruptions from plant vibrations are not possible. Nor do magnetic and electric forces affect the measurement. Independence from the conductivity of the liquid significantly expands the areas of application. The SAW transducers as fixed components of the measuring tube are connected via a measurement board to a transmitter, which contains both the user interface and the necessary output signals. The transmitter is based on Bürkert’s new electronics platform (EDIP - Efficient Device Integration), which is to be used for all future devices. The design is completely modular and therefore offers a high degree of flexibility for the customer. The connection of the electrical components is not analogue, as in the past, but digital. With EDIP Bürkert opens the door to Industry 4.0 for its products. EDIP comprises numerous functions and cross-device standardized user interfaces as well as other innovative services to facilitate the system integration of new devices. FLOWave is manufactured entirely from stainless steel and is flexible offered for the market launch in pipe diameters DN15, DN25, DN40 and DN50 with tube respectively clamp connections in accordance with ASME, ISO and SMS. The device can be used with or without a display. The display, as a separate module, can be placed at the front or on top of the transmitter and can also be rotated in 90° steps. FLOWave requires a 24 VDC power supply. Two M20 cable glands and a third gland with an M12 plug constitute the electrical connections on the FLOWave transmitter. Initially the output signals include one analogue output (AO, 4…20mA) and one digital output (DO). A third signal can be switched between AO and DO through parametrization. The device measures the volumetric flow rate to a precision of 0.4 % of reading. Temperature measurement is included as standard with a precision of £1°C. In relation to the tube diameter the nominal pressure is ≤ 40 bar. The maximum permissible media temperature is 110°C. In higher medium temperature ranges limited to the common time period required for cleaning processes in hygienic applications the use of FLOWave is proven. Further variants, additional I/O signals, implementation of Fieldbus technology and extended functions as well as extended diagnostics capabilities are in preparation, so that Bürkert will offer an entire product line of SAW-based flowmeters in the medium term.